It doesn’t take the Doctor long to discover that the final days of humanity have arrived. Peter Capaldi is the Doctor in In the Forest of the Night. The calm before the storm. The breeze before the hurricane. An episode of Grimm before an episode of Hannibal. Before Bad Wolf, there was Boom Town. Before Army of Ghost, there was Fear Her. Before The Pandorica Opens, there was The Lodger. And before the season finale for Twelfth’s first season, we have this episode. Doctor Who has seen its share of female directors, with the likes of Hettie MacDonald directing the classic Blink, Catherine Morshead behind the lens in Amy’s Choice and The Lodger, and Mary Ridge helming Terminus. It’s Sherrie Folkson, a veteran hand behind the camera since 1990, who puts her stamp on In the Forest of the Night by making the episode visually stunning. It would have been easy to simply take a standard British forest, put in a few British cars, a traffic light or two, and maybe a sign post or two directing the way to a British landmark, and simply say “hey, this is London.” Folkson and the set crew, however, manage to take the above concepts and make them work through a “less is more” style. We have Nelson’s Column to signify Trafalgar Square, several red-white-and-blue London Underground signs and subway entrances, and the occasional lamppost, abandoned car, and traffic light. Seeing these quintessentially British cultural items in the middle of an incredibly lush forest does all the “talking” the setting needs to do. The forest and its trees are definitely the highlight, however. Folkson does a great job of making it seems like the characters are in the middle of a lush, dense forest. It isn’t the same copse of trees over and over again from differently directions…it might be, but if it is, it sure as hell doesn’t look like it…it truly looks like a forest just shot up in the middle of London overnight, with branches through iron fences and vines covering the TARDIS. Folkson also deserves praise for the quick, kinetic style of directing she utilizes. The action never sits still but doesn’t get to the point of “slow down a moment” as she zooms between wide-shots and close-ups. Two scenes with the Doctor, one where he scans the children looking for Maebh and another one during his “lesson” to them about “treeeeeeeeeeeeeeeeeees” highlight a bit of the light-hearted humor this episode brings. The only directing letdown isn’t from Folkson’s hand, but from the hand of some poorly green-screened creatures during a quick detour through the London Zoo. Even for Doctor Who, the insertion of a pack of wolves and a tiger, was done poorly enough to ruin any sense that they would be a threat to our heroes. The script is actually the weakest part of the episode. I’m a bit stunned that a script Frank Cottrell Boyce penned, while entertaining, ended up being so flat and boring. Boyce is a veteran writer for British television and film, working on the long-running soap opera Coronation Street as well as writing the acclaimed script for the movies Millions and 24 Hour Party People, and has been praised for eschewing the “three-act script” and “hero’s journey” concepts in his scripts. 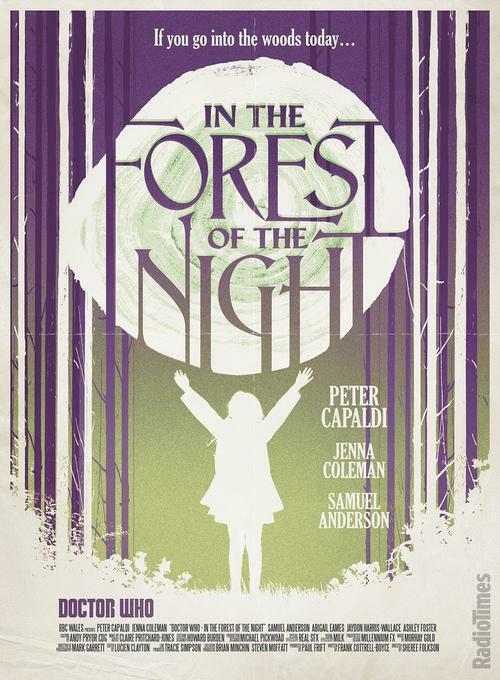 In the Forest of the Night is a different type of script than Doctor Who usually puts on screen, but as opposed to something unique like Blink or The Power of Three, the script just…sits there. The entire planet has been covered overnight (and from a picture of Earth taken from space, this includes the oceans) and the Doctor wants to figure out why, but there’s never a sense of urgency to the proceedings. Maebh is lost in the woods, but she’s never put in any sense of danger other than “oh, she’s lost” and a poorly CGI’d tiger. Clara is worried about the students under her and Danny’s care, but Danny comes off as treating the whole thing like a camping trip through the city and the students never seem to worry about their Mums, Dads, and families, more concerned with taking selfies and screwing with the control panel of the TARDIS. The episode isn’t about some evil alien or vicious creature; it’s about a mystery to be solved. But there’s no URGENCY to the mystery. Once the Doctor figures out the purpose behind the trees, he has to stop them from being defoliated…but that’s done by having the TARDIS tap into the global communications network and having Maebh politely ask people to trust the trees and not hurt them. The fact that a world-wide outbreak of spontaneous forestry doesn’t affect the strength of the world’s cell phone network ranks up there with “the moon is an egg” in terms of science-gone-wrong on Doctor Who, and having a little girl politely ask people not to harm the trees in a worldwide “guilt trip” is a very sappy deus ex machina, surpassed only by the very last shot of the episode, which makes no sense and seemed tacked on only to give the entire proceedings an incredibly happy ending. The only time the students seem to get upset is when it’s revealed that Maebh, who has been on medication since her sister disappeared a year earlier, hasn’t taken her medicine. The world is covered in trees, no one knows how their families are, they’re in a blue box that’s bigger on the inside with a man who had admitted he’s an alien, and the only time there’s a big reaction is when they’re screaming for Clara to give Maebh her pills. I’m not going to go into the specifics of why this is a VERY bad reaction for children to have on a show that children WATCH, but it felt incredibly out of place and out of sorts and only served for the Doctor to go “someone’s hearing voices and you medicate them, humans are stupid!” It’s very Jon Pertwee (in a way, the whole serial reminded me of The Seeds of Death to the point where I suspected the Krynoids were behind everything and expected the Third Doctor to show up and call the military idiots), but it just struck me as the wrong message to send out, especially to any kids that might have been watching. After being on the sidelines for the past two episodes, Danny Pink steps back into the limelight, with some character development that finally gives some insight into his inner workings. Ever since his first appearance in Into the Dalek, Danny’s main personality points have been “former soldier” and “worried about Clara being with the Doctor.” We see a little bit more of Danny’s previous profession come out in this story, as he leads his students with a reassuring cadence call through the forests of Central London. His calm in a distressing situation and his manner of taking charge when the Doctor isn’t present does more to reinforce the “former soldier” aspect than all of the anger he showed in The Caretaker. But the key development in this episode comes when, during a quiet moment, Danny explains why he doesn’t see the Doctor in the same way Clara does. She wants to see and experience everything she can, and he understands that she can have with the Doctor. But after all he saw while in Her Majesty’s Armed Forces, Danny just wants to sit back and see everything in front of him more clearly. That one sentence speaks volumes about the character of Danny Pink, that he’s seen the proverbial elephant and just wants to be a teacher. I just wish this development had come a few episodes before the season finale kicks in as opposed to right before it…and really, what kind of teacher, especially one who’s been in charge of a squad before, doesn’t notice that one of his students is missing?!? Peter Capaldi and Jenna Coleman do great with the material that Boyce’s script gives them, but in the end it doesn’t really mean much. Which is very much a shame, as there’s a great character moment for Ms. Oswald that also should have come a little sooner than right at the doorstep of the season’s end. Capaldi is in full-blown Doctor mode for this story, trying to solve the puzzle of the trees, and in a nice moment, realize and admitting he was wrong, calling himself “Doctor Stupid” in the process. Capaldi does rushed and manic very well, but in a manner different than Matt Smith or David Tennant, as if he’s actually thinking about the problem instead of throwing ideas against the wall and seeing what sticks. His interaction with the kids (and here’d a good place to say, the child actors in this episode did very well – viewers got an idea of their personalities, but not enough for them to be annoying or to overpower a scene. They came off much better than the young teenager in Kill the Moon) was almost endearing, considering Twelve’s personality so far. He actually came off as much smoother around the edges in this episode, now that I think about it; still a little detached from individuals, but not as mean or jerkish either. And it showed in a key moment opposite Clara. Last week’s Flatline saw Clara as the Doctor, making the tough calls as people died around her, takin a calculated risk to save the day, and realizing that doing as the Doctor does doesn’t make one a good person. She has to make another tough call in this episode, and Jenna Coleman sells that call. Her conversation with the Doctor is a quiet one, about how he needs to go and save himself, leaving humanity to die at the hands of the huge solar flare that was going to engulf the planet. Capaldi and Coleman, when given good material, are absolutely stellar actors and that scene shows it, Clara telling the Doctor to leave and the Doctor, in a call back to Kill the Moon, telling her that it’s his planet too before departing. At first I felt it was a little out of character for both the Doctor and Clara to act how they do…until Clara tells the Doctor that she doesn’t want to be the last of her kind. It drives home that, after all this time, Clara finally understands the Doctor and why he does what he does…and why, perhaps, she’ll never come to grips with it. To be lonely, making the tough choices, and always leaving people behind, it’s something she could never do, and something she could never make someone else go through. Again, however, it’s a GREAT character moment that really should have come a bit before the season finale so the concept could have a little time to gestate in the conscious of the viewer. In the end, did anything really change? The Earth is saved from the solar flare from the trees and humanity will quickly forget about this magical moment, just like all the other insane situations that they’ve experienced before the Doctor saves the planet, and go right back to turning the trees that saved them into furniture. Danny explained why he views Clara’s travels with the Doctor as he does, Clara explained why she could never be the Doctor, and the Doctor gains some insight into his companion and her life and lies to Danny. All these could have been seeds planted for a long-term story, but I feel like they’ll be swept under the rug when next week’s finale begins. What could have been a strong breather episode instead gives the viewer some great character development and explanation that the end of the season, per the seemingly slam-bang finale trailer, will render moot in the long run. Peter Capaldi is the Doctor in…Dark Water.